What is the For Honor Game? For Honor is a 2017 action video game developed and published by Ubisoft for Microsoft Windows, PlayStation 4, and Xbox One. The game allows players to play the roles of historical forms of soldiers and warriors, including knights, samurai, vikings and since October 2018 the Chinese Wu Lin, within a medieval setting, controlled using a third-person perspective. Why players choose Joymmo.com's store to Buy FOR HONOR Steel Credits? 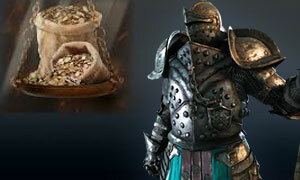 In the FOR HONOR game, which the multiplayer aspect allows players to customize their characters, but players need more steel credits to unlock and boost their characters. Both of them will be spent so many real moneys from you. But Joymmo.com's currency game store provider Cheapest FOR HONOR Steel Credits for you, we promise all of FOR HONOR Steel Credits with lowest price on the game marketplace. Safe trade, Fast delivery, and 24/7 Live Chat online support.